Two things you would probably never think to put together: strawberries and pizza. It sounds a bit strange, but trust me, it works! Actually, there are a lot of fruit and pizza combinations that go well together. Fig and prosciutto, for instance. 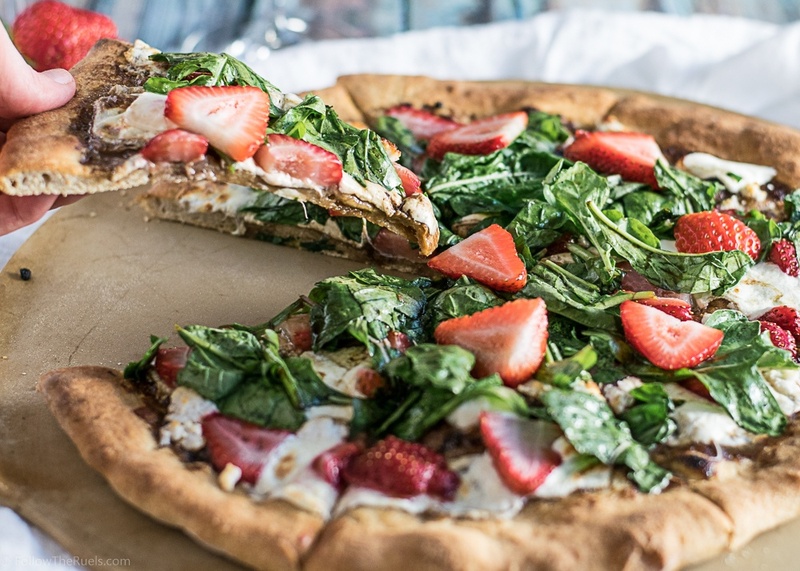 But this strawberry arugula pizza is my new favorite! I start all my pizzas by pre-baking the pizza crust. Since I don't own a pizza oven (if you do, can we be best friends and make pizza all the time?) I find that I get a crispier crust that way. For this pizza, instead of sauce, I liberally coated the par-baked crust with a balsamic glaze. You can make your own balsamic glaze by simply bringing balsamic vinegar to a simmer and reducing by half or more until it's nice and thick. Or you can do what I did and buy it at the store. You don't always have to be a hero and make everything from scratch. Next comes the mozzarella. Most of the time I like to use the fresh balls of mozzarella versus the preshredded variety, but thats a personal preference. You do you, boo. On top of the pieces of mozz, I scattered the sliced strawberries. The last thing I added before putting this bad boy back in the oven was goat cheese. I felt like this pizza needed just a little something to balance out the acidity from the balsamic and the sweetness of the strawberries. This tangy and salty goat cheese did the trick! Once the pizza came out of the oven I topped it with a generous helping of arugula that had been tossed in balsamic and olive oil. Which pretty much turns this pizza into a salad as far as I'm concerned. I can think of no better way to eat a salad than on a crispy and pizza crust. But in all seriousness, this was one of my favorite pizzas we've made in a long time. The whole thing just worked. It was the perfect Summer pizza because it was just so light and fresh. It didn't feel as heavy as some super cheesy meat-covered pizza. I guess that's why the two of us devoured this whole thing. Like I said its pretty much a salad so we have nothing to feel guilty about. Right? Preheat oven to 450 degrees. Stretch out pizza dough to desired shape and thickness. Place on to a baking sheet or pizza stone and prebake for 5 minutes. Take pizza dough out of the oven. Brush balsamic glaze over top of the crust. Top with mozzarella and strawberry slices. Drop dollops of goat cheese around the pizza. Bake for another 5 minutes until cheese has melted. Broil for 1-2 minutes, until the top of the cheese bubbles and starts to brown. Toss arugula in the oil, vinegar, salt, and pepper. Once pizza has cooled slightly, top with arugula. Slice and serve immediately.